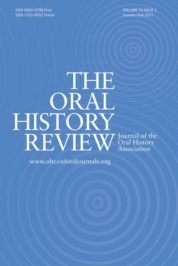 The Oral History Review, published by the Oral History Association, is the US journal of record for the theory and practice of oral history. Its primary mission is to explore the nature and significance of oral history and advance understanding of the field among scholars, educators, practitioners, and the general public. Follow them on Twitter at @oralhistreview, like them on Facebook, add them to your circles on Google Plus, follow them on Tumblr, listen to them on Soundcloud, or follow their latest OUPblog posts via email or RSS to preview, learn, connect, discover, and study oral history. Beginning in January a new editorial team will take over the OHR, bringing in some fresh voices and new ideas. Before we hand over the reins, we asked the new team, composed of David Caruso, Abigail Perkiss, and Janneken Smucker, to tell us how they came into the world of oral history. Check out their responses below, and make sure to keep an eye on our social media pages in the coming weeks for more. It’s really hard to get dead people to talk to you. Séances don’t count. For my doctoral degree at Cornell University I researched the history and use of American military medicine from the Spanish-American War through to the First World War. I buried myself in various archives, digging my way through voluminous folders to find answers to a plethora of questions. I read memos and reports, analyzed admission applications and equipment orders, and pulled out as much information as I could from the century-old records, and then coupled all of those with personal memoirs written in the aftermath of war. But there was no one left alive who could answer my questions directly—I had to use my training in historical research to come up with the most likely truths that the archives and books could provide. I also had the opportunity to work on smaller, contemporary projects that focused on the history of science, involving both archival research and the chance to actually speak to scientists and engineers. The frustrations I felt when researching the history of American military medicine were nowhere to be found when working on these contemporary projects. Near the end of my graduate career there was a job opportunity at the Chemical Heritage Foundation, an independent, history of science-based research library in Philadelphia. The position entailed interviewing biomedical scientists who received an early-career grant from the Pew Charitable Trusts; I saw it as an opportunity to better understand the history of modern biomedical research funding by talking to the individuals whose work benefitted from that financial support. I came to oral history not through a formal degree program but by realizing the limitations of traditional historical records, and deciding that I needed to talk to people to understand history better. While working on the biomedical scientists’ project, I ensconced myself in the world of oral history, fortuitously meeting Roger Horowitz when he was a fellow at the Chemical Heritage Foundation. Roger introduced me to Oral History in the Mid-Atlantic Region, which led me to the Oral History Association. As an undergraduate at Bryn Mawr College, I studied sociology, history, and creative writing with the intention of carving out a life at the intersection of storytelling and social change. My last year there saw the US invade Iraq, and I undertook an independent senior thesis to examine whether and how Americans were using the memory of Vietnam as a way to understand and engage with the current conflict. My thinking was that I would interview folk singers from the 1960s and contemporary folk singers/singer songwriters, as the creators of collective memory, to see how each cohort was conceiving the situation in Iraq. Over a few months in the spring of 2003, I interviewed more than a dozen musicians, including Pete Seeger, Janis Ian, and Mary Travers. The project was completely flawed, methodologically and conceptually, but I was hooked. It’s really hard to get dead people to talk to you. Séances don’t count. From there, I studied documentary writing at the Salt Institute for Documentary Studies in Maine, and then completed a joint JD/PhD in US history at Temple University. Oral history played a central role in my dissertation research, and continues to define a significant part of my scholarly and pedagogical identity. Today, I am an Assistant Professor of History at Kean University in New Jersey, where I teach courses in US history, African American history, legal history, and oral and public history. From 2013-2016, I worked with undergrads at Kean to develop a longitudinal oral history project on the relief and recovery efforts in the aftermath of Hurricane Sandy. I will be using those interviews as the backbone of a narrative monograph documenting the uneven recovery of Hurricane Sandy along the New Jersey coastline. Looking back over the last 20 years, there’s no specific moment when I began to self-identify as an oral historian, but somehow the method has been a reoccurring theme in my academic career. As a college senior, I interviewed individuals for my senior seminar paper at Goshen College about the origins of the college’s Women’s Studies program. When I began studying quilts from an academic perspective, my first paper was based on an oral history interview I conducted with my elderly grandmother about the quilts she and her Amish-Mennonite peers made as young women in the 1920s in eastern Ohio. I then conducted around thirty interviews for my doctoral dissertation research focused on the relationship of Amish quilts to the art market and consumer culture. All of sudden, it felt like I’d become a bit of an oral historian, which made sense since much of my research focused on contemporary history topics from the 1970s and 80s. I now regularly teach with oral history, working with my students at West Chester University to create digital public history projects, interpreting and providing access to archival oral history interviews, by building classroom/archive partnerships that take advantage of open source technologies. In the spring 2018 semester, I’ll be teaming with WCU colleague Charlie Hardy to teach a new course, Immigration and Digital Storytelling, which will draw on a collection of oral history interviews Charlie conducted in the early 1980s with immigrants who moved to Philadelphia from Europe early in the twentieth century. Join us in eagerly welcoming the new team in the comments below and on Twitter, Facebook, Tumblr, and Google+. Featured image credit: Listen by Simon Law. CC-BY-SA-2.0 via Flickr. David Caruso is Director of the Center for Oral History at the Chemical Heritage Foundation. Abigail Perkiss is an Assistant Professor of History at Kean University in Union, NJ. She is trained in US history, oral history, twentieth century urban culture, African American history, public history, and legal history. Janneken Smucker is an Associate Professor of History at West Chester University where she specializes in digital history, public history, and American material culture. She's the author of Amish Quilts: Crafting an American Icon.